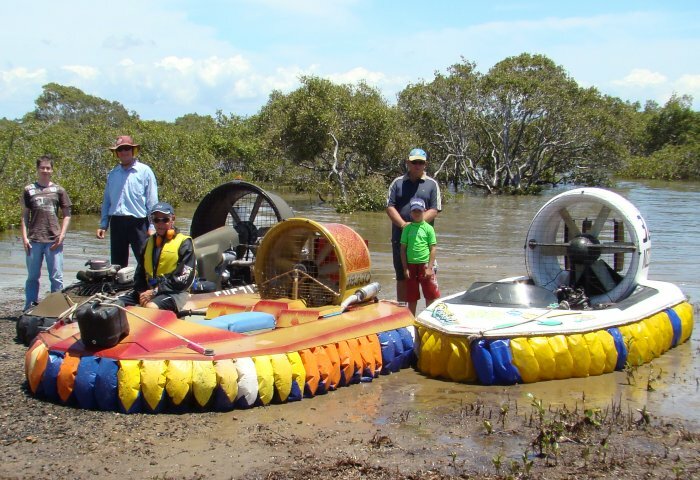 The next Queensland Sporting Hovercraft Club planning meeting will be on Tuesday 15th January 2008 at 7:30 pm in the Sporting Aircraft Association of Australia hall at Archerfield aerodrome. Enter via the main entrance off Beatty Road. Cruise report - Waterloo Bay, Thorneside - Sunday 9th December 2007. Our intention to launch at the Colmslie ramp was soon dispelled when we were met by a dire shortage of trailer space in the park. I reckon every one with a boat had turned out at Colmslie with the ideal conditions to have a day on the water. I met the other CRUISERS at the entrance and we decided to revert to THORNESIDE. We find this spot very handy due to our monopoly as the ramp has a SUITABLE FOR HOVERCRAFT ONLY designation. Our cruisers for the day were Angus and Lucas. Steve came along to battle against the elements, it was a bit windy but tolerable. 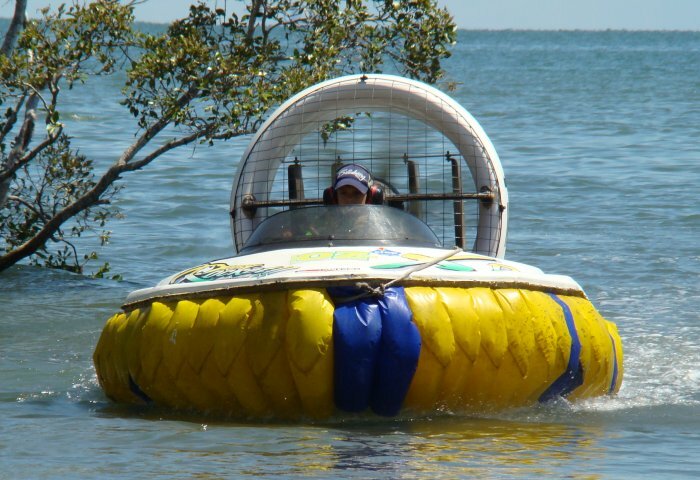 I was the 3rd hovercraft and ready to test my craft after repairs and maintenance when I lost a drive belt at the end of the last cruise in October. Our support crew was Arthur Stead, who should be joining us soon on these cruises with his own craft. Michael Noble is getting to be a regular and drags his parents along. I try to give him a ride in my craft when he comes along. He is in the process of building a craft so we have to keep him motivated. I hope he sticks to it and he manages to complete it in a reasonable amount of time. When we three set off the wind had increased slightly. We set off to Wellington Point. Steve turned back with a small problem. Angus and I settled on the Wellington Point ramp and answered a few queries from interested people. From there we moved around to KING ISLAND where we settled on the beach in the warm sun. 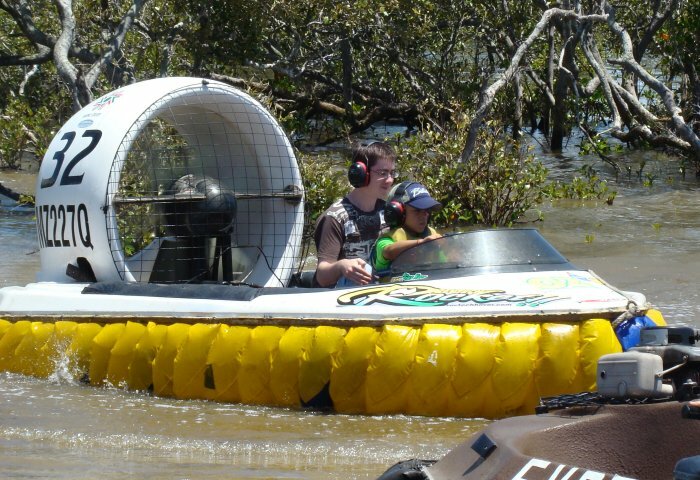 We soon had a few spectators, these were tourists and wanted all the ins and outs of the hovercraft principles. Our trip back to the ramp was good, we followed the shoreline around and running with the wind it was a great place to be. When we got back Steve had sorted his problem and had stayed in the launch area. I hope to see more craft on the CRUISES in 2008 and longer cruises, and in order to avoid the windy conditions later in the day we should aim to set off earlier. The first club cruise for the new year will be held on Sunday 13th January 2008 at Queens Esplanade, Thorneside. Meet at 9:00 am at the boat ramp along Queens Esplanade near Bates Drive, for a launch into Waterloo Bay. UBD Reference - Map 164 H17.